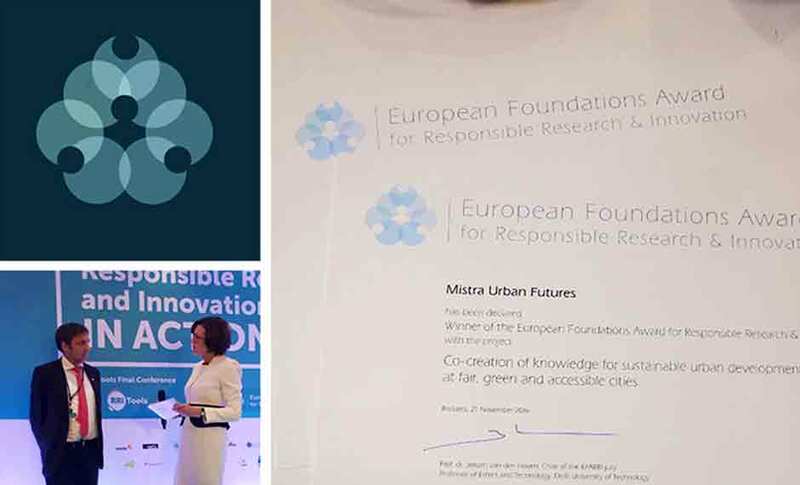 Mistra Urban Futures, the Swedish centre for sustainable urban development, has won the first European Foundations Award for Responsible Research and Innovation (EFARRI). The Award recognises research projects that have successfully incorporated RRI practices that align research with the needs of society and actively contribute towards the development of a smart, inclusive and sustainable society. The Swedish centre was nominated was for its trans-disciplinary approach that uses reflective co-creation and co-production of knowledge to address sustainable urban development issues. It shares its award with two other projects, the Italian water management project IMRR and Spanish miCROWDscopy. A scientific jury selected the winners from more than 200 applications. The winners share a €20,000 prize to support further work in their fields. The EFARRI is a joint initiative by the King Baudouin Foundation (Belgium), “la Caixa” Foundation (Spain), Fondazione Cariplo (Italy), Lundbeck Foundation (Denmark), the Robert Bosch Stiftung (Germany) and the European Foundation Centre Research Forum. Read more about the work of Mistra Urban Futures. It also features as an inspiring practice in the EU- funded RRI Toolkit. To find out more about Responsible Research and Innovation (RRI) visit the RRI Tools website or contact Karin Larsdotter at VA (Public & Science).